Join me to take a look around the beautiful Show Gardens at the RHS Malvern Spring Festival 2018. Following on from my visit to the RHS Flower Show Cardiff last month, I was really looking forward to my next garden event. 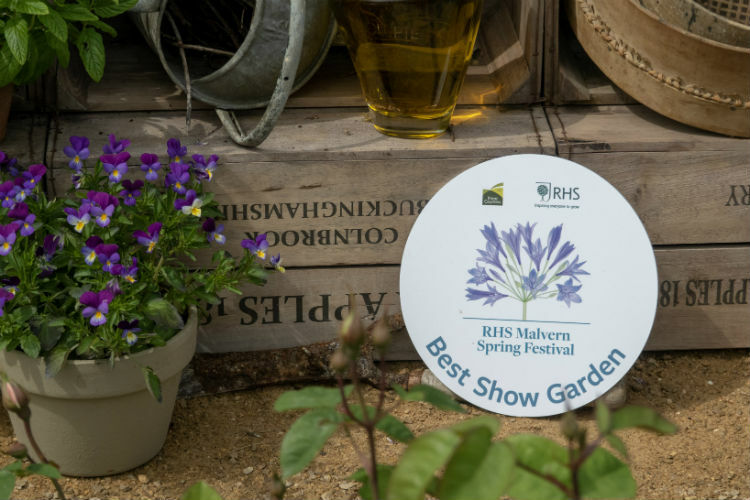 The RHS Malvern Spring Festival takes place each May at the Three Counties Showground. The beautiful Malvern Hills form a dramatic backdrop to a fantastic day out for gardening enthusiasts. Delivery of the client’s brief- will the imagined client be happy? Have the objectives been acheived? Design of the garden – is it original? Does it work for its supposed purpose? Construction – what standard is the build quality? Is there attention to detail? Planting – does the planting work together to create impact? Are the plant associations correct? Overall impression – does the garden work as a whole? Is the choice of materials aesthetically pleasing? There is no limit to the number of each medal that can be awarded, and if an exhibit is judged to be below Bronze standard, no award will be given. The judges also make awards for the Best Show Garden and Best Construction at the show. So here are my highlights from the Show Gardens at the RHS Malvern Spring Festival 2018. The design of Billy’s Cave brings to mind the slow pace of life on a smallholding in rural Portugal. And in the Spring sunshine, this garden really did feel like it was transporting you to another country. The planting is Mediterranean in style, with large olive trees, palms and swathe of lavender, while the bright red flowers in the planting scheme add a pop of contrast. And there’s even a cool dark cave which is ideal shelter for a small herd of goats! This garden was designed by Villaggio Verde, and won a Gold medal from the RHS Judges. The next garden is more modern in design, with bright zingy colour throughout. Urban Oasis is designed for relaxation and entertaining guests, and has a decking area with a steel framed pergola. The pergola, yew hedge and four large Prunus maackii trees offer both shade and privacy. You can really imagine sitting out here with a cold drink on a summer’s evening. A zig-zag board walk winds its way through soft meadow-like planting, and the dark timber background offers contrast to the bright colours in the garden. This garden was one of several which made use of bright orange Geum flowers, which are really on-trend this year! And of course, the abundance of meadow flowers means that this garden is very wildlife friendly. I spotted several bees making the most of the display. Urban Oasis was designed by Mark Draper, and won a Silver-Gilt medal. This beautiful garden was designed by Peter Dowle, who won Best Show Garden at the RHS Malvern Spring Festival in 2017. The Spirit of the Woods uses sculpture as a medium to explore our spiritual connection with nature. A peaceful pool is overlooked by The Whispering Spirit, and surrounded by moss and ferns. Outside the garden stands Sylph – a ballerina formed from a thousand copper leaves. The garden is surrounded by an oakland, and the ‘borrowed scenery’ of the Malvern Hills provide the perfect backdrop. Although a large proportion of this garden is flooded with water, there is also plenty of ground cover provided by foxgloves, irises, saxifraga and peonies. And there is a beautiful selection of Acer palmatum and Cornus kousa around the pool. Each sculpture is framed beautifully, illustrating the importance of context when you are adding sculpture to a garden. The overall feeling created by this garden is one of peace and tranquility. It’s a beautiful design which won another well deserved RHS Gold medal for Peter Dowle, and also won the Best Construction award. But if your garden doesn’t quite have room for a pool and sculptures in it, don’t worry. The Bovis Homes Family Garden was designed by Dan Ryan to be suitable for a property within a new housing development in the Cotswolds. It has a contemporary feel, and provides space for both children and adults to enjoy. Cotswold stone has been used for both the walls and the built in seating, and there is a lawned area for young children to play on. The space also includes a kinetic sculpture and a water feature. The planting combines white flowers with a variety of colours and textures of grasses and foliage. It certainly feels like a design that could easily be replicated at home. The RHS judges awarded this garden a Silver-Gilt medal. The Perfumer’s Garden has a very whimsical and romantic feel to it, and was designed by Ruth Gwynn and Alan Williams. They drew inspiration from the Great Exhibition of 1851, when entrepreneurs from around the world displayed their raw materials and finished products in the Crystal Palace in London. The garden celebrate the three notes which make up every perfume: The light head notes, the longer lasting middle notes, and deep earthy base notes. There are large, densely planted raised beds, full of plants such as tuberose, vetiver and citrus. All of these are scents which are commonly found in perfume. The garden is given height by several trees as well as tall metal poles. A copper water feature forms the centrepiece, and copper piping winds its way through the garden. And a bench by the back wall provides a quiet place to sit and think. Looking around this garden, you really feel as if you are in a perfumer’s paradise with a very rural feel about it. This beautiful garden was awarded an RHS Gold medal. And the judges also picked this as the Best Show Garden of the RHS Malvern Spring Festival 2018. The Collector’s Garden was designed by Olivia Kirk, and takes inspiration from Victorian plant hunters. The design includes a range of familiar plants which were once considered exotic, alongside some that have been introduced by today’s plant hunters. The soft white and blue planting throughout the garden combines with the green foliage and cool stone wall to give the garden a very peaceful feel, while height is provided by some impressive hornbeam trees. And the bright orange of these Geum provides a flash of contrast against the muted tones of the rest of the garden. The Collector’s Garden also showcases some beautiful historic porcelain, which is housed within three glass bell jars. They are surrounded by plants which inspired the artists who painted the Royal Worcester porcelain pieces. Planting from this garden will be relocated to the Royal Porcelain Works after the show. Olivia Kirk’s garden was awarded a Silver-Gilt medal by the RHS Judges. The Dew Pond was one of my favourite designs at this year’s RHS Malvern Spring Festival. It was designed by Christian Dowle, the brother of Peter Dowle whose work you saw further up the page. They’re obviously a talented family! I love the gentle, romantic feel of this garden, and it’s also a design with an important message. It envisages a future garden which is sustainable, productive and helps to conserve biodiversity. The garden also includes a small orchard area with old fruit tree cultivars, and the silver birch and purple hazel trees provide the natural canopy found in our woodlands. And I just love the pathway through the soft planting in the garden. Dew ponds are an important part of our agricultural heritage, and provide a rich habitat for wildlife. The deck and garden room in this design allow you to enjoy the surroundings. They are all constructed from locally managed timber, and the garden room has a living roof. The Dew Pond was awarded a Silver medal by the RHS judging panel. And last but by no means least, Memories of Service. I have a particular attachment to this design, as my Dad served for 25 years in the Royal Air Force. This garden celebrates the centenary of the formation of the RAF, and commemorates the 100th anniversary of the end of World War I. Gates at each corner of the garden lead towards a central sculpture formed from aircraft parts. The pathways cross at the central seating area, suggesting the shape of aircraft propellers. The garden has precisely clipped hedges to create a sense of enclosure, and the birch trees in the garden allude to early plywood airframes. There are several sculptural steel panels throughout the garden, and a red, white and blue planting scheme. And these, together with the overall shape of the garden, bring to mind the traditional roundel on RAF planes. It’s a beautiful tribute to all those who serve and have served in the RAF. Memories of Service won a well-deserved RHS Gold medal. My visit to the RHS Malvern Spring Festival was a fantastic day out. Which is your favourite garden? Fantastic show displays, I especially loved the urban oasis with it’s minimalist design and bold colours in contrast with a lush almost wild garden. My friend just got a job with the rhs. I’m expecting tickets to all these shows now cause they look awesome. I would love that job – I really enjoy visiting the shows! So many breathtaking displays! Makes me want to stare out at my garden and curse my non-green fingers! Sounds like such a great event for inspiration.